Newer Yahoo Mail has banner advertisement on the right side as against top banner ad in previous Yahoo Mail classic. Due to right side placement the email reading space reduces and can cause discomfort with user having to scroll down to read full email message. Now you can disable right banner advertisement temporarily and read email messages with more screen space. 1. Goto YahooMail.com & login into your account. 2. Click Hide Advertisement link located in the middle of vertical advertisement banner. Clicking that link will collapse advertisement banner and provide more space to view inbox content. Do you see advertisement banner at top instead of right side? This may happen if you are using old Yahoo Mail classic interface. Just click ‘try new Yahoo’ link at the top to switch to new Yahoo Mail interface so as to hide advertisement banner as explained above. As pointed by YMail Blog, this for sure is handy addition for users with small display screen. 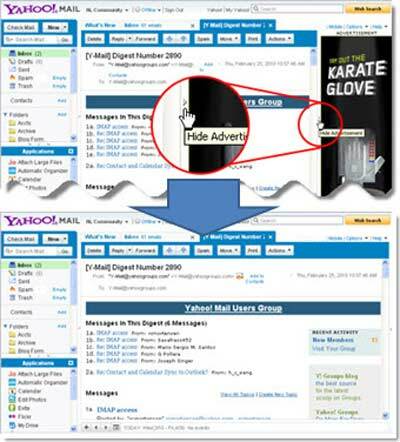 Now they can read email content with more comfort by hiding banner advertisement. Please note: advertisement is only hidden temporarily – for permanent ad free Yahoo Mail you can upgrade to pro email account (which is paid). How do I remove the banner ad on righ so my email is full page permanently. I know how to remove it temporarily.